We have a tradition for Easter of a huge breakfast with lots of fun involved. First off everyone has to design and color their own eggs, yes that includes the adults too. We break out the canyons, color and dye the eggs. 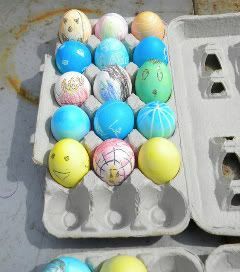 There are pumpkin eggs, pirate eggs, hulk eggs, spider man eggs, and tye dye eggs. Each different each belonging to someone. Now on Easter the tradition is to crack them against one another to see who the winner is, the winner is the one with the last unbroken egg. If you look at an egg you will notice it's oval in shape. To crack eggs you must hit fat end to fat end. Some one holds their fat end of the egg up with their hands around the egg and the other person hold their fat end down. The one holding fat end down smacks the other egg lightly to see who's cracks. I, alas, did not win this year though I did have a long run with out my egg breaking. That is just part of the Easter tradition we have. The "Easter Bunny" hides plastic eggs filled with candy all over the living room and the kids get to find them. It usually works out that there are more hidden than found. I'm still not quite sure where they disappear. Then there is breakfast. It's all about the breakfast. Borscht, with Easter kielbasa, rye bread, horseradish and egg, potato pancakes with sour cream or apple sauce. A feast that will fill you up for the day. Or so I thought till my youngest was complaining of starvation 2 hours later. That's really all there is, no big dinner or nothing, usually a movie during the day. Today was so nice outside (76° F) we decided to go to the beach. I was surprised how many people there were there today, it being Easter and all. We got down there and all there was was fog. Really bad fog, I'm talking Stephen King kind of fog. You couldn't seen very far at all. The car in the picture was about 100 ft from us. Though we were lucky, the sun pushed though and lifted most of it. There was some haze off the ocean. 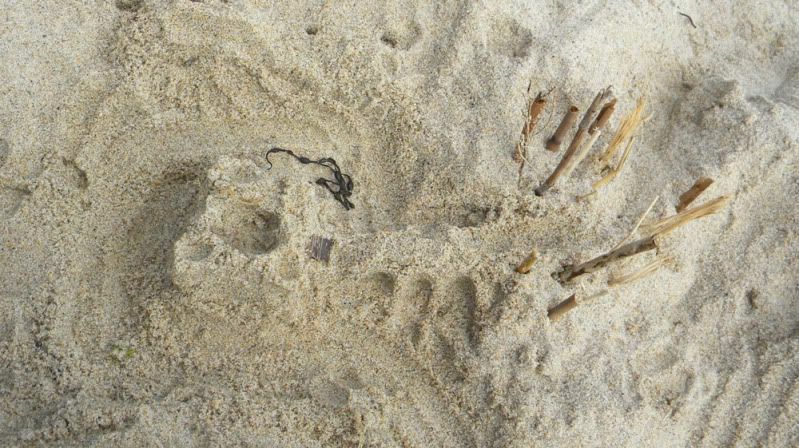 I even got around to building a nice tiny little sand castle, with a mote, mote monster, bridge and enchanted forest. Hehe. If you look hard yo might see it. It's the first time I've ever been to the beach on Easter. I still remember snow on Easter and it usually being cold. It made it a really great day! We decided to build boxes for our garden this year after reading so much about how it was better to grow that way. It increase yield and you use less space so you can plant more. We figured that instead of going out and renting a tiller like we usually do, we would recycle/upcycle some lumber we had laying around and build the boxes. Granted these are not the best looking boxes but they didn't cost me anything, (infact they saved me $60 for not needing the tiller,) but if I get a year or two out of them I will be happy. I've been slowly working on building the boxes and getting them in place. 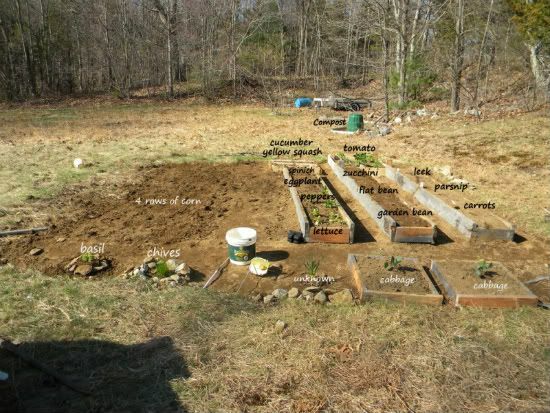 The first box is already planted with seeds and my daughter's cabbage is planted as well. You can see one of the big boxes that was just set in the garden for placement. Being in New England we have very rocky soil so there are piles of rock all around the outside of the garden. It's tough to tell but there is actually a ledge to the garden, it's down from the grass about 2-3". 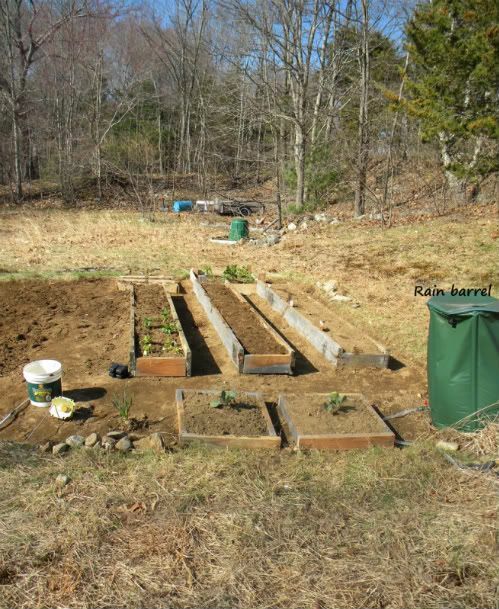 I spent all afternoon digging up dirt and filling boxes with it, compost and a couple of bags of organic soil mix. The rain barrel we use to help water the plants. It's a long way from the house, ~200ft, to run a hose to water them but we will if needed. Right now after winter the barrel is about half full. The long boxes are spaced out enough so that you can comfortably walk between them. I still have the cucumber, yellow squash, zucchini, beans, eggplant and spinach to plant. The unknown plant in the front I think is garlic but I have no clue. We'll have to wait and find out later. 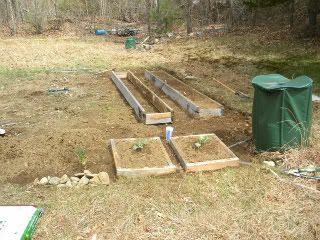 The garden last year was actually another 2 feet wide and we didn't nearly have as much in it. Here's to keeping my fingers crossed that it does good. I did it I made my blog! :) But now what...Let me tell you a little about me and what I do. I'm the sort of person who needs to constantly have something to do. If I'm not doing something I'm bored and miserable. I have been making things, creating things, for a long time now. It started out when I was little and a neighbor introduced me to plastic canvas and counted cross stitch. I love to do counted cross stitch and I still have projects I'm working on around my house. The problem that I have with counted cross stitch is that it's very time consuming and I really need to be fully focused on it, which is hard when there are kids running about. All through out highschool I drew pictures and I still paint, mostly ACEO's when inspiration hits. I started sculpting when I was in college. I took a sculpting class in which we explored natural clay, plaster, and plasitcs. For our final sculpture of the class one dimension had to be our height. I made what I entitled "Phat Phish". I built it in the garage as it was to big to be in the house. Not thinking about having to move it to the college I made it in one giant piece. My dad had fun trying to fit it in the minivan. That was fun!! I picked up sculpting again after I met my husband only this time using polymer clay. I love making things out of clay. There's just so much you can do with it. I've also unsuccessfully sewn things. I bought a sewing machine after I found some patterns that I found that I wanted to try to make. I got as far as pulling the pattern out of the envelope and being dumbfounded by what I found inside. Apparently sewing from a pattern isn't for me. I've made blankets, quilts, ornaments sewing but I'm by far not proficient in it. Then I discovered book binding. I'm not exactly sure how I did, but I did and I loved it. I love trying to create books from unique things. I love working with paper and folding it to make something lovely that people can write in and create their own drawing in. It's creating something that someone else can love and use just as much as I loved making it. I've made sketch books and CD books, tiny scale books and necklace books, books to write in, to draw in, to add pictures in, each different and unique. The very first book I made I still use to this day. I made it to keep all the information we use when we go geocaching. It's been through the woods and back and it's held up just fine, almost looks as good as the day I made it. I love the challenge that comes with book binding. I look at somethings and just say to myself "I bet I could make a book out of that." and in most cases I do or will try. I love to experiment with different papers and coverings. I find it relaxing and fun.